Regular readers know that I’m interested in how Old and New intersect in the world of wine — and that I like to push arguments to their extremes (that’s why my next book will be called Extreme Wine). So it should come as no surprise that I sought out extremes of new and old during my time in Cape Town. And I sure found them! My interest in seeing what’s new in South African wine provoked me to call on a number of wineries in the CapeWine 2012 exhibition hall. One of them was De Toren Private Wine Cellar, a boutique winery started by Emil and Sonette Den Dulk in 1994 to make Bordeaux-style wines that showcase Cape wine terroir. The first wine, a 1999 vintage, was Fusion V, a left bank (Cab-centered) Bordeaux blend using all five (or V if you will) traditional grape varieties. I tasted the current release of De Toren Fusion V as well as a right bank (Merlot-centered) blend called De Toren Z. Both were classic representations, noteworthy for their fine tannins and delicate balance. This part of the New South Africa is doing very well, I thought. And then things started to get extreme. Emil reached behind the counter and pulled out a bottle labeled “Book 17 XVII,” the most extreme wine in the De Toren collection. It’s extreme in several ways at once. First, its inspiration is pretty extreme. 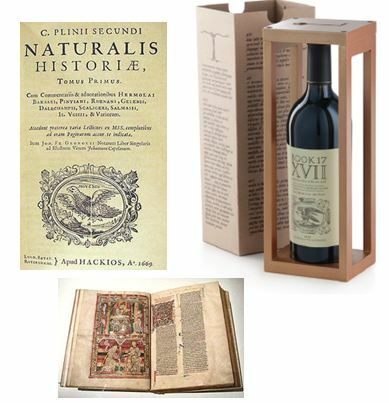 Pliny the Elder wrote about wine and viticulture in Book 17 of his treatise on Natural History and De Toren sought to apply Pliny’s farming principles to make a modern wine (Emil showed me the relevant passages from Pliny’s text). Pliny’s favorite wines were quite sturdy, potent and age-worthy, but elegant, too, and that’s what this project aimed to achieve. Having started with an extremely old way of growing grapes, De Toren’s winemaker Albie Koch then studied the most extreme contemporary winemaking techniques, focusing on cult wines such as Screaming Eagle and Harlan Estate. Extremely low yields in the vineyard (300 grams of grapes per vine). Hand de-stemming, foot stomping, hand punch-down and 200 percent (not a misprint) French oak. I tasted from one of the extremely scarce 650 bottles that resulted. I don’t have much experience tasting cult wines and I admit to being a little frightened as I stared into the black hole at the bottom of the glass. Book 17 XVII was notably darker and more extracted than the other wines I had tasted. But in fact the wine was balanced and elegant and while all the oak showed in the glass it didn’t knock me down with a two-by-four as might happen in less skilled hands. Going to extremes without going over the edge is a tricky business and you can see it in Neil Martin’s Wine Advocate review of the wine (I think he was tasting from barrel). On one hand “It has a super-ripe creme de cassis, fruitcake and fig scented bouquet with a palate that is ostentatious to the point of vulgarity” which sounds like it’s over the top. “However, this full-bodied turbo-charged wine is so damn silky smooth and seductive in a super-Tuscan kind of way, that its charms will be nigh impossible to resist.” Hmmm. Sounds a little like Lady Gaga. Making cult wines must be a bit like the “chicken game” in Rebel Without a Cause. I think De Toren Book 17 XVII succeeds in mixing ancient inspirations with extreme techniques to make a very interesting wine. Martin was obviously seduced by the wine’s elegance in the end (as was I), which pulled it back from the cliff edge at the last minute. Unlike the Z and Fusion V wines, I wouldn’t want to drink XVII every day (which would be impossible in any case given cost and limited production). But I appreciate its potential to make wine enthusiasts reconsider the potential of South African wine. 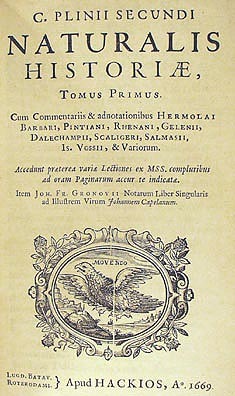 Is that an angry chicken or a screaming eagle on the title page of Pliny’s book? You be the judge. Thanks to Emil Den Dulk for letting me taste the wines and providing helpful background information. « South Africa: Old World or New? Definitely sounds like the wines worth seeking. Thanks!